These bronze figurines celebrate your unbreakable familial bond by linking mom with up to three children. Isn't it amazing how your mom is always there to catch you when you fall? 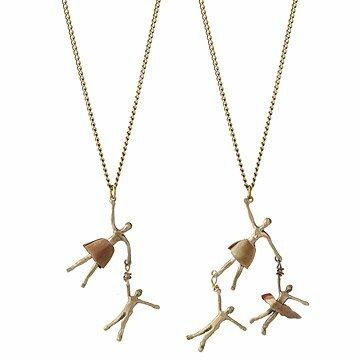 This bronze, brass, and copper sculpted figurine necklace celebrates your unbreakable familial bond by linking your choice of up to three children. Each piece is individually forged, soldered, cast and cold-connected by metalsmiths John & Linda Whitney in Florida. Bracelets available with your choice of 1, 2 or 3 children in any combination of boys and girls. Please check out our Family bracelet and additional charms, also by John and Linda Whitney. As an art student at University of Kansas in the 1970’s, John Whitney would sketch his future wife Linda’s orchestra rehearsals and quartet workshops. Gathering inspiration from the alluring sounds and sleek structure of the instruments, John turned the drawings into sculpted figures using traditional metalsmith techniques. Today, John and Linda design their one-of-a-kind creations together in Sarasota, Florida. With the help of their studio assistant, and their perky Havenese “art dogs,” they invent, forge, and stretch the possibilities of their beloved craft. I wear this necklace often. Goes with everything. Received as a moms day gift 3 years ago, worn 3-4 days a week since. So beautiful, goes with everything. Perfectly epitomizes what it feels like to be a parent, this is my favorite piece of jewelry. However, several months after receiving, one of the bracelet "kids" started falling off and I have since lost one. Then about 6 months ago I started losing one of the necklace "kids" and am now down to one. They've never been worn in shower or bed. I'd love to know how I can replace them. Most unique necklace! Perfect gift! Very unique necklace that you wont see alot of which makes me like it even more. Omg this was a hit everyone asked where I bought this! Everyone loves something different !!! I have bought 3 necklaces. Both daughters like their gift. The pictures on the website don't do this justice. The skirt on the little girls is a really nice patine and color. I bought this because my wife is expecting and I have my birthday on Valentine's Day and I'm kind of sick of always being the one to receive - instead of give a present on this tackiest of days. She hasn't taken it off yet. Gets many comments. This was a perfect gift for my mom's birthday. It's unique and she loves it! I do wish that the boy figure had some copper on it, maybe pants or shorts?